For instance, hike on the hardest trail you can find. Challenge your teenager to hike up Sentinel Pass above Moraine Lake, the highest maintained trail in Canada! Meanwhile, you can stroll along the lakeshore and have lunch at the very civilized Moraine Lake Lodge restaurant. Along the same lines, your teen can hike to the top of Sulphur Mountain while you take the gondola to the top. While waiting, there are a couple of short strolls for the rest of the family along the summit ridge and a restaurant with a view. The most exciting whitewater rafting in the area is on the Kicking Horse River and the steepest, muddiest, rockiest mountain biking trails can be found at the Kicking Horse Mountain Resort (near Golden B.C., lift-assisted). ACMG-certified mountain guides can be hired for a day of rock-climbing on real mountain cliffs. And if that doesn’t get them pumped, dare your teens to swim in one of our freezing cold glacial lakes! Again, there are always gentler activities nearby for the rest of the family to enjoy — although you won’t want to miss the look on your teens’ faces when they hit the water! There are grizzlies at Kicking Horse Mountain Resort, wolves at the Wolf Centre (near Golden), and every predator from the Rockies to Africa at the Calgary Zoo. You could check out new bathing suit styles at the Banff, Radium, or Miette hot springs. The Banff Centre offers dance events (lots of tight costumes!). Or, kill two birds with one stone by participating in a high energy sports class at the Sally Borden Building in Banff or the Jasper Activity Centre. Feed your teenager a really big meal! Growing teens are renowned for their appetites and the Rockies are renowned for bountiful buffets. Eyepopping Sunday brunch buffets can be found at all the Fairmont hotels, and the Banff Park Lodge is famous for its “Fountain of Chocolate.” Breakfast buffets can fuel your teens for the day’s exciting activities you planned for them and be a more affordable way to pack in the calories. Keeping your teenager interested doesn’t have to be a drag for you. The Canadian Rockies offer a great combination of teen-friendly challenges and entertainments while also providing a large variety of wonderful (read “less energy draining and more interesting”) things to do for the discriminating non-teen. Don’t miss the stories behind the scenery of the Canadian Rockies! 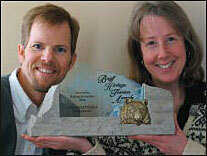 Nadine & Joel are award-winning and accredited professional guides. Join us for half or full day interpretive walks, hikes and snowshoes that feature an equal mix of fun and learning. Great Divide Nature Interpretation, Lake Louise.